Fall is the perfect time for homeowners to make sure their home is safeguarded from winter’s frosty grip. Small improvements can make a big difference in the overall comfort and efficiency of a home, and people often need the assistance of a professional contractor to complete fall repairs and maintenance. Help them head off expensive repairs when you complete some of these important fall maintenance tasks. Pay attention to gutters. A gutter system diverts thousands of gallons of potentially damaging water from around a home every year, so make sure this system is flowing smoothly after the leaves fall. 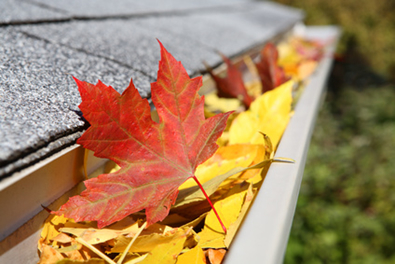 Clogged gutters can lead to damage to the gutter itself, and contribute to the formation of ice dams in the winter. To keep debris from accumulating over the winter and for years to come, install Clean Mesh® or Screen Mesh® from Southeastern Metals™. These patented gutter protection products are specially engineered to draw rainwater into the gutter trough, while keeping leaves and debris from entering. Seal air leaks. The U.S. Department of Energy estimates that minor air leaks around windows and doors can account for a 15% increase in a home’s heating bill. Check for missing or damaged caulk around windows, and inspect weatherstripping for deterioration, replacing if necessary. Gaps around pipes, vents and electrical outlets are other prime locations for air leaks and should also be sealed up. Stay on top of roof problems. Few problems are more frustrating during cold winter weather than a leaky roof. Finding the source of the problem can be especially difficult as temperatures dip below freezing, so stop problems now with a complete roof inspection. Check the roof for missing or damaged shingles, and gutters for excessive amounts of shingle granules that indicate a roof is in need of replacement. Inspect metal flashing around chimneys, skylights, vents and valleys. Care for the heating system. A furnace system, like a roof, should be serviced by a qualified professional before winter weather arrives. If cleaning and inspection is ignored, a system can quickly wear out, leak deadly carbon monoxide into a home, or stop working when it’s needed most. Get additional information on metal roofing, ventilation products and other building components by calling Southeastern Metals™ at (800) 874-0335 or submit a contact request. SEMCO products are precision-engineered and manufactured for long-term performance in every season.